As Middle Easterners honor the victims of recent terrorist attacks around the world, some say they feel their tragedies have been sidelined in this outpouring of grief and that the Arab world has been unfairly cast as fostering extremism. 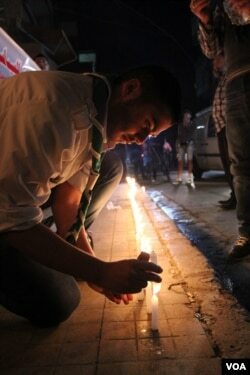 In Beirut, mourners honored the 43 victims of two bombings last week. Some said in the wake of the attacks in France, they felt forgotten by traditional and social media that present attacks on the West more prominently than those in the Middle East. “One thing that bothers me is the absence of media during the explosion in Beirut, as everybody’s posting about the incident in Paris,” Chala Wahbi, a marketing executive, said outside a cafe in Beirut. Across town in the southern suburbs near the bomb sites, other residents said they were also shocked by the attacks in France, a country they see as safer than Lebanon. 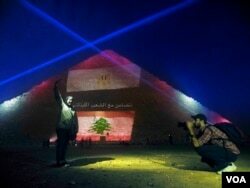 In Egypt, ministers and mourners gathered to grieve, and Lebanese, French, and Russian flags lit up the pyramids. Besides the attacks in Paris and Beirut, Egyptians were also honoring the victims of a plane crash that killed 224 last month in Egypt. Almost all the victims were Russian. But others in Cairo said the outpouring of grief for France highlighted a lack of sympathy for the suffering in the Middle East. Islamic State militants who have claimed responsibility for attacks in recent weeks in France, Egypt, Lebanon and Jordan, killing more than 400 people, are from all over the world, not just the Middle East, Alaa said. But the Middle East, he said, has suffered the most. Refugees escaping Islamic State-occupied territories in Syria and Iraq have reported that IS “police” on the street include people who appear to be from Europe, America, Africa and the Far East, all speaking formal classical Arabic rather than any regional dialect. 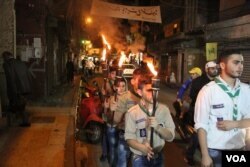 A recent poll suggested most Syrian people think the United States and its allies created the Islamic State group. In Egypt, young people often blame the West for the carnage, or at least for not preventing it. They also blame Arab governments for Western alliances. But at the French Embassy in Cairo on Sunday, other locals left flowers, and Arab dignitaries said they were proud of their Western alliances. France, according to Palestinian Ambassador to Egypt Gamal el-Shobaky, is a historical leader of democracies.